More Than a First Aid Kit, HART Health First Aid Stations are much more than basic first aid kits. 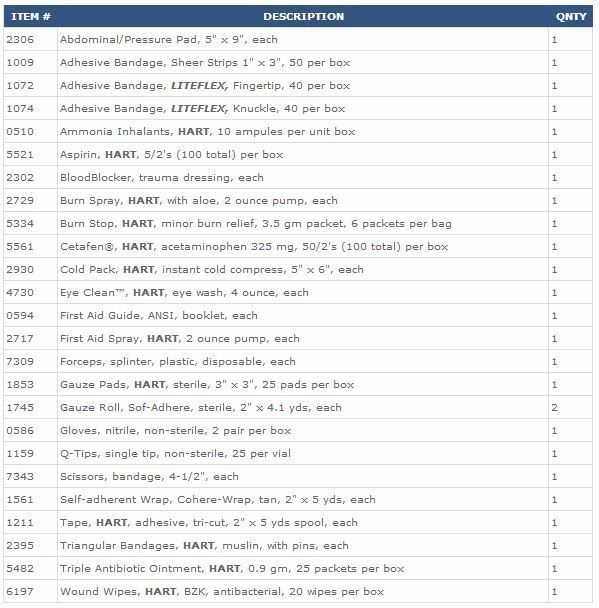 Stocked with a full complement of immediate care medical supplies and non-prescription medications, they help keep workers on the job and productive. These stations are designed to meet more than the standard first aid kit needs of the workplace. By including frequently used medications and items for minor injuries in one convenient location, workers may quickly treat their aches, pains, and discomforts then return to work. FIRST AID STATIONS, HART, heavy gauge baked enamel metal cabinets stocked to meet your employees' first aid needs, small, 2 shelf cabinet, 14-7/8" x 10" x 4-5/8"
FIRST AID STATIONS, HART, pseudoephedrine-free, heavy gauge baked enamel metal cabinets stocked to meet your employees' first aid needs, large, 4 shelf cabinet, 14-7/8" x 21-3/4" x 5-1/2"
The Bulk #25 and #50 Kits are designed to help meet the first aid needs of the workplace. Responder and Trauma Kits are Designed to meet the needs of emergency, occupational, and sports health care professionals. 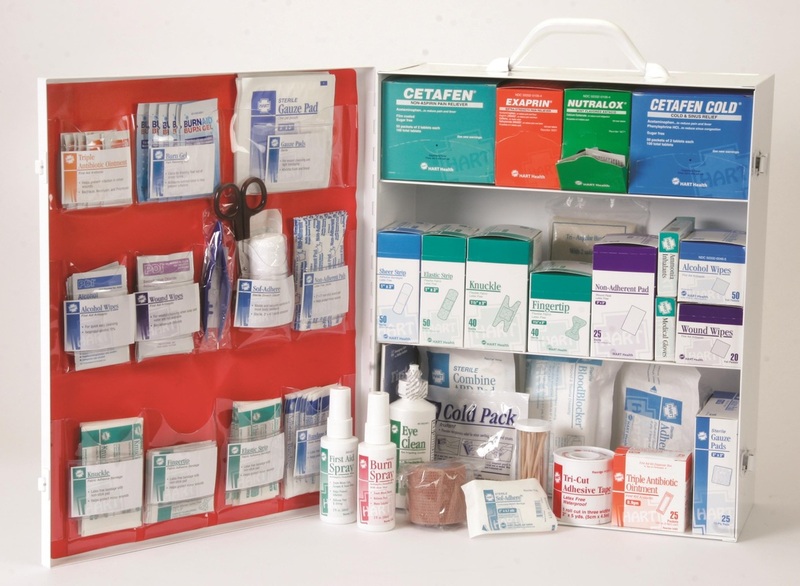 FIRST AID STATIONS, HART, pseudoephedrine-free, heavy gauge baked enamel metal cabinets stocked to meet your employees' first aid needs, medium, 3 shelf cabinet, 13-1/2" x 16" x 5-1/2"
FIRST AID STATIONS, HART, pseudoephedrine-free, heavy gauge baked enamel metal cabinets stocked to meet your employees' first aid needs, large, 5 shelf cabinet, 19" x 27-3/4" x 6-1/2"
SOFT PACK FIRST AID KIT, HART, contains first aid items packed in a red nylon pouch. Unitized kits feature components in industry standard sized boxes.